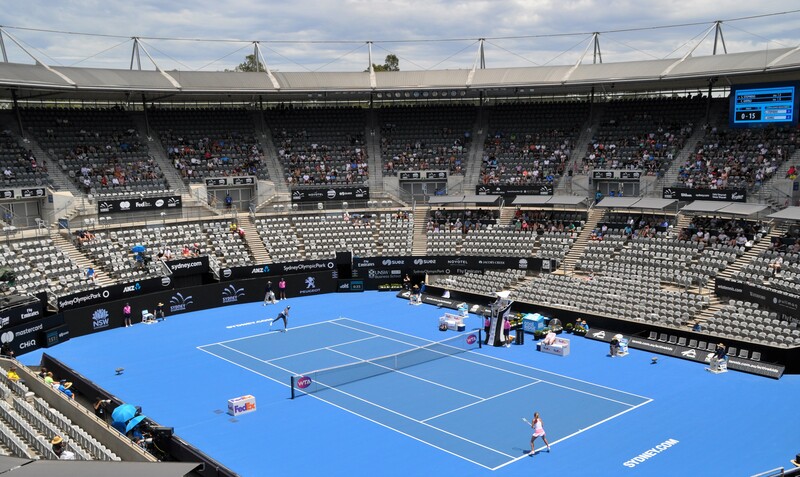 The second tournament that we visited in Australia was the Sydney International. In the week before the Australian Open, Sydney always attracts a decent line-up from the WTA with six members of the world’s top 15 present in 2018. Note there is also an ATP 250 event although we didn’t watch any ATP matches! We attended on the Monday where first round matches were on the order of play. Read on for my recap and photos of the matches we saw and a review of the tournament as a whole. 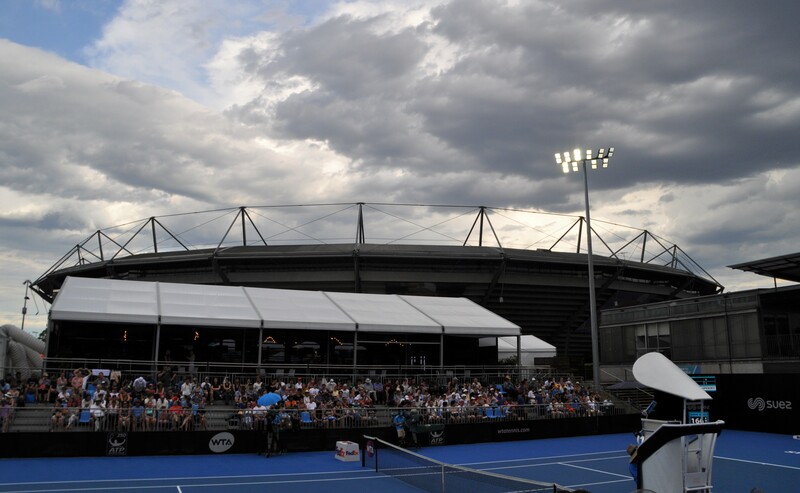 For a review of the Hopman Cup in Perth, click HERE. 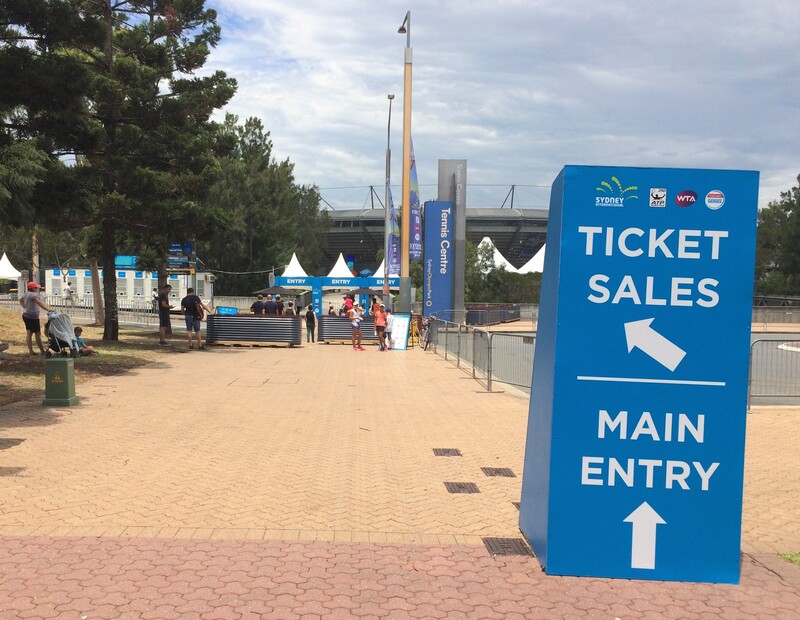 The Sydney International is super cheap and buying tickets was a breeze. The tournament has an “any three day pass” for $30 Australian dollars where you can attend any three day sessions between Sunday and Thursday. You can also give your tickets to friends/family. We weren’t sure beforehand what day we were going to go so really liked the flexibility of this offer and it was only $9 more than selecting a single session. Adding up the fees and with the exchange rate, it was roughly £20 per person which I thought was very reasonable. I would have loved to go more than once but time was limited and we really wanted to see more of the city! Details about Sydney tickets can be found on the official website. Tickets can be purchased around October time from the Ticketek website. 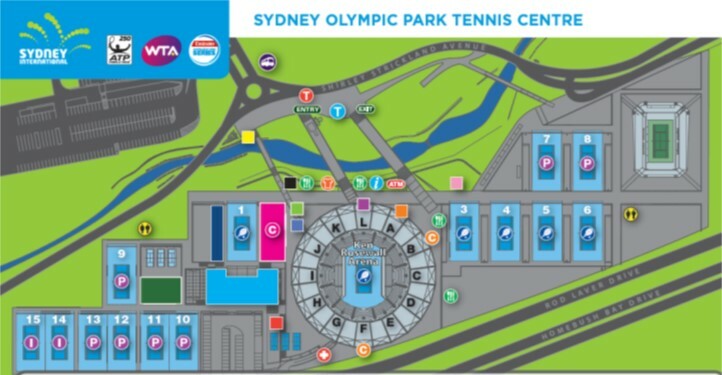 The Sydney International is located in the Sydney Olympic Park, about 15 kilometres out of the city. After a morning spent in Central Sydney we got a train from Circular Quay to Lidcombe which took about 30 minutes. We were then intending to change onto the Olympic Park T7 line to get to the Olympic Park. However, when we arrived at Lidcombe there was an announcement that the train was being replaced by a bus service. This was a surprise! It was a short ten minute bus ride to the Olympic Park train station where we were hoping to catch the advertised free shuttle bus to the tennis. Unfortunately, there was no sign of any buses and the staff member waiting there was unhelpful and told us there was no transport to the tennis. We ended up walking to the tennis which wasn’t much fun in the 30C midday heat. We finally arrived at just after 1pm. We saw the tournament shuttle bus on our arrival at the venue. We wondered if it wasn’t operating because we arrived quite late with play already underway. When we left the venue during a thunderstorm (I have wonderful memories of legging it in the rain 😂) we managed to catch the shuttle bus back that went from the entrance of the tennis to the Olympic Park train station. Still, we were a bit disappointed with the lack of information and presence of the tournament when we arrived. My advice – check trains before going and at least know how to get from the train station to the venue if the shuttle bus is nowhere to be seen! We both took our rucksacks as there was no mention of them in the list of prohibited items on the Sydney International website. We each had a bottle of water and some food, and had no problem taking it into the venue. Again, 200mm was the limit of camera lenses. The grounds are pretty compact and were quiet apart from when the main stadium emptied out. There were plenty of shady areas and drinking water facilities. The tournament was well prepared for the hot weather. KRA looks quite small from the outside because the court is sunk down so it’s quite impressive when you enter the stadium for the first time. I like that they have these door shutters outside the court which were only opened at changeovers so there was never an issue with people coming in during play. It was a hot day when we attended, the day after the records and still about 32C, so we obviously went for the shady seats! It was general admission so we could pick pretty much any seat and we had a great view of the tennis. The seats were pretty comfortable and there was plenty of leg room. While there was a solid scattering of people in the upper tier, it was easy to find an empty row. I liked Court 1 which had two stands on each side and was overlooked by what I believe was the media centre. Note that front row seats were obstructed with the view so we sat a bit higher up. 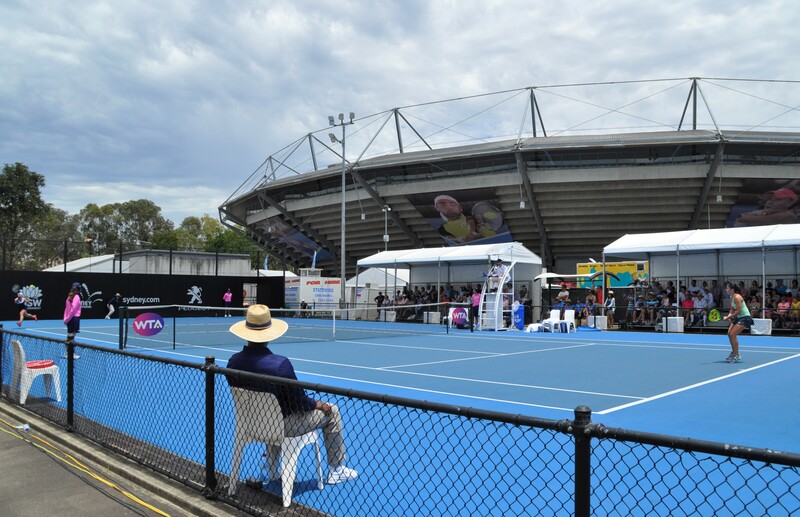 We watched one match on this court and saw players, umpires and media all watching the action. We watched singles matches on these two courts located east of KRA. We had no problems getting a seat in the shaded stands on Court 4, or just standing and watching on court 3 (see picture below). It was very quiet on the outside courts and rather surreal not to have to fight through crowds! I wonder if this was due to the weather? We only found practice courts 7 and 8 which were on the eastern side of KRA and we saw Jelena Ostapenko practising. It was fantastic to get up so close (and with no netting!) in the two to three minutes that I braved the sun. There are another series of practice courts west of KRA on the map but we never got round to seeing them. I read fans on Twitter complaining about access to the practice courts so I wondered if they were referring to these ones. 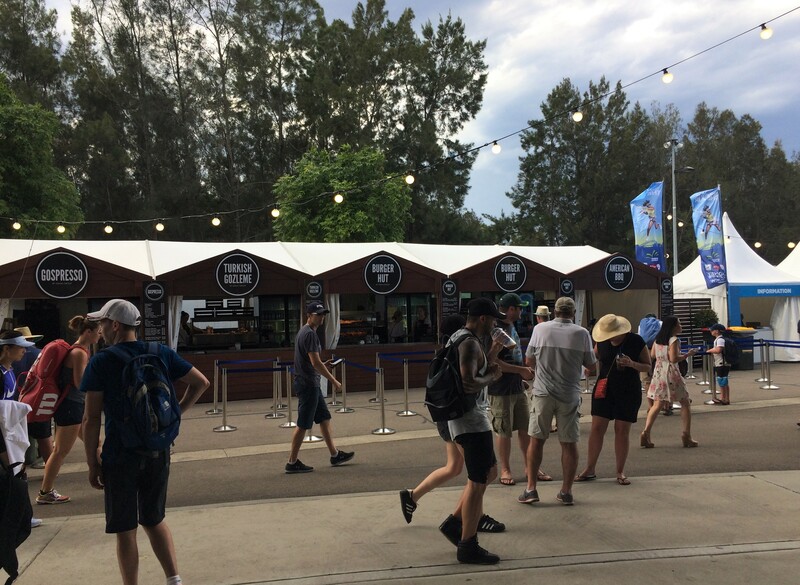 We’d already eaten lunch before we arrived at the tennis so didn’t really to get explore the food and drink options. All the stands are located outside of KRA and there seemed to be plenty of options. I bought some chocolate ice cream in the afternoon from the Italian Artisan Gelato stand – very nice! Once we arrived we headed straight to Court 3 where Cibulkova and Sevastova were into a second set. Cibulkova looked very sharp and was completely engaged with her team, dishing out endless pomes. Sevastova looked close to tears. Cibulkova saved two break points when leading 4-1 and that was that as she rolled through the final game. Cibulkova, who was playing her first match of 2018, was super pumped and I got one of my best pictures of the day of her celebration. Ten minutes later we saw Sevastova practising on a nearby court. I have to be honest that this was one of the worst matches I ever watched live 😂. We turned up towards the end of the first set and Stephens, who spent most of the match shaking her head, was having an absolute shocker. It was Stephens’s first match of 2018 and it really did show with laboured footwork and so many errors long. There was a feeling of disinterest, or at least a feeling that Stephens wasn’t in the mood to try and turn this match around. Giorgi played a very solid match and was never threatened. The Italian would go onto to have a superb tournament, reaching the semi-finals as a qualifier. Giorgi practically ran off the court at the end, only to be stopped by the interviewer. He was very perceptive, asking only two questions and realising she wanted to go! We stayed for the first set of the second match on KRA which was much, much better than the first. I was excited to watch Barty live in singles for the first time and was not disappointed. She had a few sticky moments and her defensive backhand slice was often drifting long, but her serve on the key points was superb. Watching Barty construct points is a delight! Cepede Royg is a solid hitter so it wasn’t an easy match for the Aussie. Barty, with plenty of support from some kids at the back of the stadium, came through to win the opener, 6-3. I’d tagged Kasatkina-Strycova as my hipster match of the day on the outside courts so couldn’t miss out! We arrived at the end of the first set where a pumped up Strycova won the opening set. Kasatkina immediately broke at the start of the second set and in true Strycova style, the Czech player launched a ball out of the court in frustration. This earnt her a code violation and was generally bizarre considering she was a set up and only an early break down. Kasatkina would go onto win the second set although I was not really convinced by her performance. Lucie Safarova (my fave) was soon to come onto court so we sadly left. Strycova eventually won in three sets, 6-4 in the decider. The match of the day (in my biased opinion!) was the all unseeded affair between Kerber and Safarova on Court 1. Thankfully we got there in time before the crowd filled up and took up seats in the stand closest to KRA. We initially went for the front row but then realised we couldn’t see over the barrier in front so went back a few rows. Monday was an odd day with the schedule because they had a men’s FAST4 exhibition on KRA in the evening so only had two matches on KRA. It just so happened that Barty’s match finished as Kerber-Safarova was set to start so everyone headed to Court 1. This was the best match of the day – some of the rallies in the first set gave me goosebumps. It was a bit of a rollercoaster with Kerber three times failing to hold onto a break of serve. Kerber was unable to serve out the set at *5-4 with a tame game, double faulting down break point. This was when we had our first rain delay with thunderstorms looming overhead. I couldn’t believe the size of the raindrops! On heading back out to Court 1, we opted to watch on the opposite side of the court where the view was much better. At the start of the second set the clouds loomed again and there was a lot of thunder and lightning in the area. The pictures below show Lucie looking up at the sky! Eventually the Supervisor came onto court and play was suspended before the rain came – that was a first! We managed to get off court before the rain came and huddled under KRA. An epic thunderstorm ensued. My goodness, i’ve never heard thunder claps like it. A tough decision but we decided to leave as we knew we had a longish journey ahead of us to get back into the city. We managed to catch the free shuttle bus back to the station. By the time we had got back to the station it had already stopped raining! I was live scoring the match while we ate in a restaurant near Circular Quay and was gutted to see Lucie miss out on match points. Kerber won in three sets and would go onto win the title! For more photos from Sydney, check out the link below from the MTB Facebook page. It was a short but sweet experience at the Sydney International. The travel to the tournament dampened the experience a tad but access to the tennis was great. While it would have been nice to have had more days at the tennis, we knew that we had Melbourne coming up so opted to spend more time exploring Sydney. I’d definitely recommend the three day pass which is great value and offers plenty of flexibility. Take a bus from Circular Quay to Bondi Beach and do the coastal walk from Bondi to Bronte. The scenery is stunning. We did this on the hottest day on record in Sydney (temperatures > 40C!) but I think it was better than just sitting on the beach as there was the slightest breeze. Take a ferry to Manly and walk towards North Head. We started the walk but ended up turning back – time wasn’t on our side! I really liked Manly and we found the most amazing fish cafe near the southern end of the beach. There are great views of the city on the ferry back to Circular Quay.